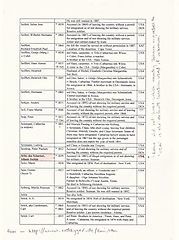 Johann's birth certificate lists his surname as "Scharmer unehelich spurius Seitz", meaning that his name was Scharmer with no legal right to use the name Seitz. This suggests he was illegitimate. 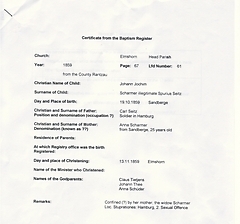 Indeed, the baptism register notes his birth was a result of 'Unzuchtsfall' which would denote illegitimacy. His mother never married his father. Instead, by the time Johann was born, Anna had married Johann Thee, who appears as his godfather on his birth certificate. 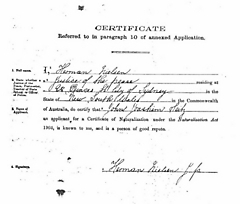 On 27 September 1876, aged 17, Johann emigrated to Australia on board the Herschel. At the time, Germany was politically unstable with ongoing factional wars and religious tension. There was compulsory conscription to the German military. Also, Johann's mother had died just two years earlier. 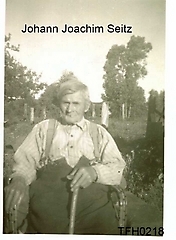 Later, in 1883, Johann was charged with illegal immigration and not showing for military service. 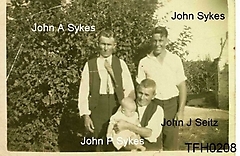 However, as Johann was in Australia (and possible going by the name John Sykes), he never answered the charges in Germany. 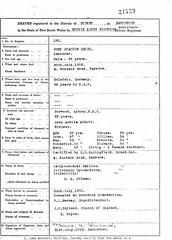 At the time of his emigration, there was a program of subsidised or free passage in place, which helped in making German immigration the third highest source of immigration for Australia in the 19th century. The Herschel departed from Hamburg on 27 September 1876 and arrived in Adelaide, South Australia, on 12 January 1877. The Herschel was an iron ship, 50.3 metres long of the Rob M Sloman & Co Line. It was originally a British ship bulit in 1865 called the "Edith Byrne". On this voyage (the fifth of seven to Australasia), it weighed 743 tonnes, and carried 302 persons, 80 cases of bitters, 300 tonnes of coal, 250 dozen bottle sof beer, 2 casks of sardines and 12 bales of paper. 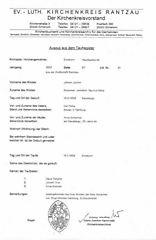 Its master was J Kammann. 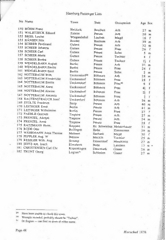 Oddly, Johann is included on the Hamburg departure list but, due to transcription error, not the Adelaide arrival list. 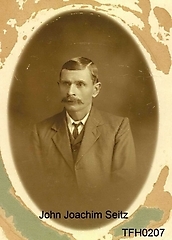 Johann stayed in Adelaide for two years before moving to Sydney, New South Wales. 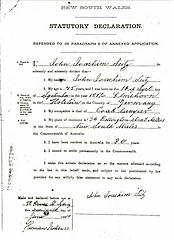 Johann was residing in Concord when he met and married Lucy Amelia Abbott in March 1883. 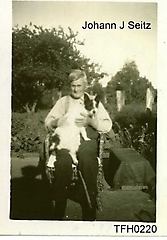 There was some urgency with the marriage, as thier first child, Ada, was born in july the same year. At Concord, Johann lived close by to Lucy's family - other houses on Concord Road included William Abbott, Richard Morgan, Joseph Morgan, and Frederick Morgan. 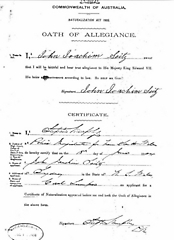 After further children and moving to 34 Bettington Street, Millers Point by 1904, Johann became naturalised and took the Oath of Allegiance. 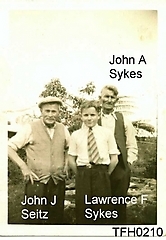 By the time of his death in 1952, Johann was living at 4 Windsor Road, Padstow. He died of myocardial failure/ chronic myocarditis. 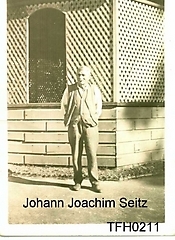 Johann was aged 92 at his death, even though his death certificate says 96, and his grave inscription and funeral notices referred to him being 97. This discrepancy may result from forgotten dates, or Johann at some stage pretending to be older (possible to emigrate from Germany). 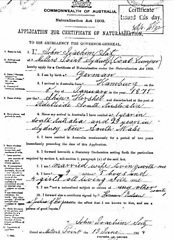 It is also noted that his naturalisation application says he arrived in Australia in 1875, when he actually arrived in 1877. 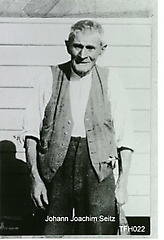 Another discrepancy is that his death certificate states he had lived in New South Wales for 80 years, when it was actually only about 73 years. 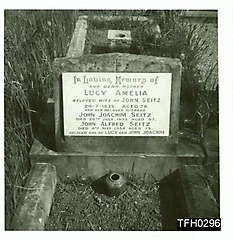 Johann was cremated and placed with Lucy's grave in Northern Suburbs Cemetery (Section A5, Lot 3). 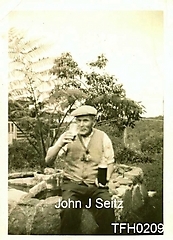 On the marriage certificate for his son, John Alfred Seitz, Johann was named as John Henry Sykes.